WASHINGTON (AP) — Protesters set fires and hurled bricks in a daylong assault on the city hosting Donald Trump's inauguration, registering their rage against the new president in a series of clashes that led to more than 200 arrests. Police used pepper spray and stun grenades to prevent the chaos from spilling into Trump's formal procession and evening balls. Several spirited demonstrations unfolded peacefully at various security checkpoints near the Capitol as police helped ticket-holders get through to the inaugural ceremony. Signs read, "Resist Trump Climate Justice Now," ''Let Freedom Ring" and "Free Palestine." But about a mile from the National Mall, police gave chase to a group of about 100 protesters who smashed the windows of downtown businesses including a Starbucks, a Bank of America and a McDonald's as they denounced capitalism and Trump. Police in riot gear used pepper spray from large canisters to help contain the violence, which erupted periodically throughout the day. "They began to destroy property, throw objects at people, through windows. A large percentage of this small group was armed with crowbars and hammers," said the city's interim police chief, Peter Newsham. Six officers suffered minor injuries, he said. The confrontation began an hour before Trump took the oath of office and escalated several hours later as the crowd of protesters swelled to more than 1,000, some wearing gas masks and with arms chained together inside PVC pipe. One said the demonstrators were "bringing in the cavalry." When some crossed police lines, taunting, "Put the pigs in the ground," police charged with batons and pepper spray, as well as stun grenades, which are used to shock and disperse crowds. Loud booms echoed through the streets about six blocks from where Trump would soon hold his inaugural parade. Some protesters picked up bricks and concrete from the sidewalk and hurled them at police lines. Some rolled large, metal trash cans at police. 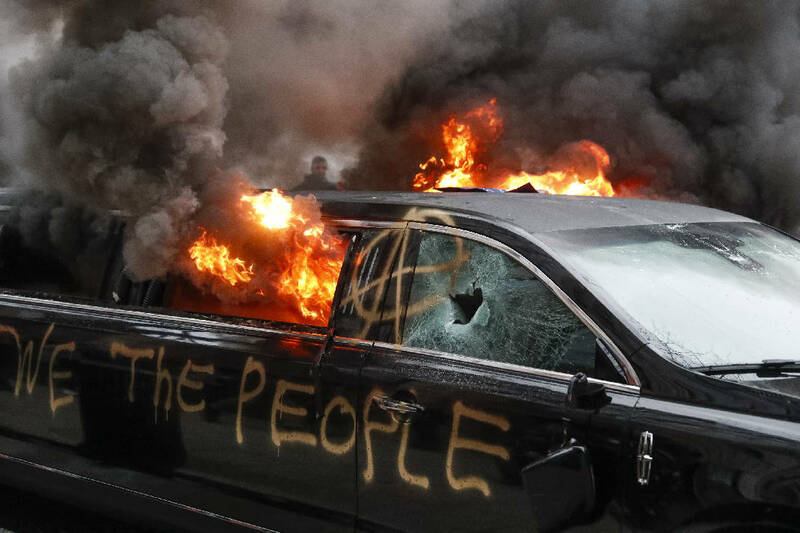 Later, they set fire to a limousine on the perimeter of the secured zone, sending black smoke billowing into the sky during Trump's procession. As night fell, protesters set a bonfire blocks from the White House and frightened well-dressed Trump supporters as they ventured to the new president's inaugural balls. Police briefly ordered ball goers to remain inside their hotel as they worked to contain advancing protesters. Police said they charged 217 people with rioting, said Newsham, noting that the group caused "significant damage" along a number of blocks. Before Inauguration Day, the DisruptJ20 coalition, named after the date of the inauguration, had promised that people participating in its actions in Washington would attempt to shut down the celebrations, risking arrest when necessary. Trump supporter Brett Ecker said the protesters were frustrating but weren't going to put a damper on his day. "They're just here to stir up trouble," said the 36-year-old public school teacher. "It upsets me a little bit that people choose to do this, but yet again, it's one of the things I love about this country." At one checkpoint, protesters wore orange jumpsuits with black hoods over their faces to represent prisoners in U.S. detention at Guantanamo Bay. Eleanor Goldfield, who helped organize the DisruptJ20 protest, said protesters wanted to show Trump and his "misguided, misinformed or just plain dangerous" supporters that they won't be silent. Black Lives Matter and feminist groups also made their voices heard. Outside the International Spy Museum, protesters in Russian hats ridiculed Trump's praise of President Vladimir Putin, marching with signs calling Trump "Putin's Puppet" and "Kremlin employee of the month." Friday's protests spread across the nation. In San Francisco, thousands formed a human chain on the Golden Gate Bridge and chanted "Love Trumps hate." In the city's financial district, a few hundred protesters blocked traffic outside an office building partly owned by Trump. In Atlanta, protests converged at City Hall and a few hundred people chanted and waved signs protesting Trump, denouncing racism and police brutality and expressing support for immigrants, Muslims and the Black Lives Matter movement. In Nashville, half a dozen protesters chained themselves to the doors of the Tennessee Capitol. Hundreds also sat in a 10-minute silent protest at a park while Trump took the oath of office. Organizers led a prayer, sang patriotic songs and read the Declaration of Independence aloud. In the Pacific Northwest, demonstrators in Portland, Oregon, burned U.S. flags and students at Portland State University walked out of classes. About 200 protesters gathered on the Capitol steps in Olympia, Washington, carrying signs that included the messages "Resist Trump" and Not My Problem." Olympia police reported about 100 marchers causing some traffic disruptions downtown, and protesters also marched in Seattle. The demonstrations won't end when Trump takes up residence in the White House. A massive Women's March on Washington is planned for Saturday. Christopher Geldart, the District of Columbia's homeland security director, has said 1,800 buses have registered to park in the city Saturday, which could mean nearly 100,000 people coming in just by bus.